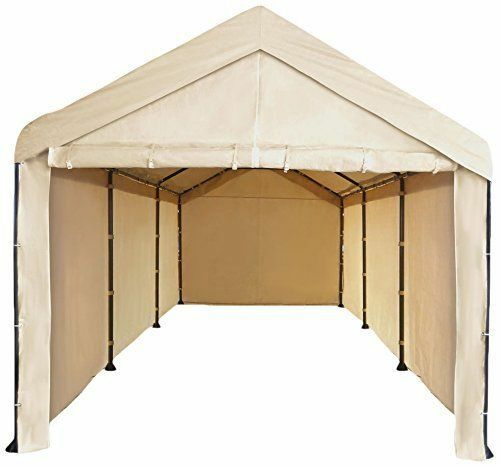 This heavy duty, durable vinyl tarp is made to fit the newer dark brown Costco frame that uses a push button assembly system. 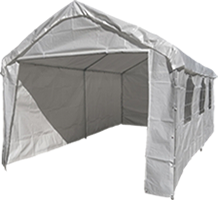 Our thick vinyl tarp is the more economical version of our heavy duty valanced top covers. 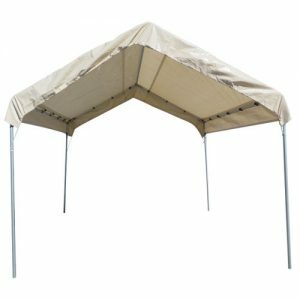 This flat tarp style roof cover does not have a 10 inch flap on each side or wrap around the front and rear of the frame using a pull rope. There will be approximately a 3" gap between the side poles and the tarp to allow for tightness. 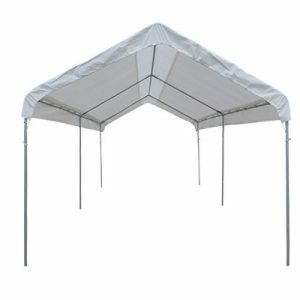 This tarp fits the Costco frame by using ball bungees through the grommets and around the top frame poles. Oregon Tarp Company’s vinyl top tarp roof cover for the Costco 10x20 frame measures 10' 7" x 29'7" with grommets placed every 18" around the perimeter. Approximately 50 6" ball bungees are required to properly secure your tarp. Our tarp top cover will allow a 2-3 inch gap between the tarp and the frame for tightness. Ball bungees are not included with the Costco flat tarp style carport cover and can be found under bungee cords on our products tab. We stock this cover in Tan. For other colors and sizes please call 541-951-2861.